Chuck Knows Church is two online video series that help interpret complex subjects and issues in a fun, yet informative, way. Each series features “Chuck” who helps us learn more about our church while inviting us to have deeper conversation with our pastor or priest. The ORIGINAL SERIES is all about the objects, symbols and terms we often hear in church. Take a couple of minutes each week and have some fun while you learn from Chuck. Each week a different video is released on YouTube and announced on the Chuck Knows Church Facebook page. There are currently ore than 90 episodes available on a variety of topics with more being produced. Each episode is approximately 2-5 minutes. THE COMMITTEE is a humorous and poignant online series that examines the struggles congregations face as they look toward a preferred future. Using real-world topics, The Committee is sure to open discussion in your church. Designed for both individual viewing and group study, each free episode also has a free downloadable study guide. A new video is released each month on YouTube and announced on the Chuck Knows Church Facebook page. We plan to produce 12 episodes that will address complicated subjects. Each episode is approximately 10-13 minutes. All funding for Chuck Knows Church videos is provided by Discipleship Ministries, an international agency of The United Methodist Church. If you are a United Methodist, your generous support of The World Service Fund helps support Chuck Knows Church. What rights do I need to play the videos? 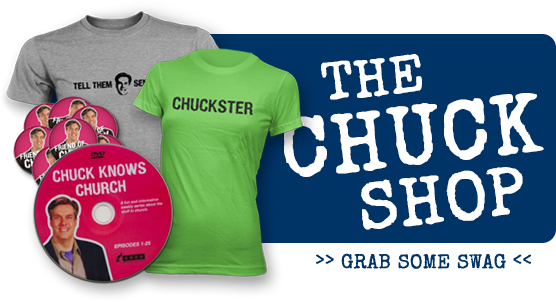 All Chuck Knows Church videos are yours to view anywhere, post anywhere, duplicate and giveaway. Changing the length, or in any way altering the content is strictly prohibited. Discipleship Ministries of The United Methodist Church holds all copyrights to all Chuck Knows Church videos. May I make copies of the videos for my church's small groups? Chuck is Chuck! What can we tell ‘ya? He’s also a very knowledgeable guy. We have always felt that Chuck's identity was part of the fun. If we tell you Chuck is a clergy person then some may want to know which seminary he attended, which church he serves, if he’s left handed or right handed. If he’s a layperson, some will want to know if he’s trained to give such churchy advice, and where he attends church. But, we realize some people are not satisfied with that answer. We looked for a long time to find the right person to deliver the message of Chuck. After a series of auditions in three states we found that person in Josh Childs, a Christian leader here in Nashville who loves God and loves the church. On set we call Josh "Chuck." He's literally the smartest guy in the room and adds to the scripts along with the rest of the producers and writers. Josh is part of our family now. He's our personal friend. Who produces Chuck Knows Church? Discipleship Ministries of The United Methodist Church produces Chuck Knows Church. A guy named Rev. Steve Horswill-Johnston, Chief Communications Officer at Discipleship Ministries, is the creator and senior producer of the show. We have a team of consultants headed by Rev. Taylor Burton-Edwards, Rev. Jeffrey Campbell, and Rev. Craig Kennet Miller, are theological consultants for the two shows. Volumes have been written about many of the subjects Chuck addresses. Your pastor will know much more. We are trying to create a strong bond between clergy and laity. You sure can! Downloads are free. How 'bout that? Download an episode from the Original Series here. Download an episode from The Committee here. Videos are encoded at the highest possible quality while keeping their size small enough to download. A download could take up to 20 minutes depending on the speed of your Internet connection. I've downloaded a video, but it won't play correctly on my computer. Make sure you have the most recent version of your media player. Check the information about QuickTime or Windows Media Player. In what formats are the videos available? Original Series episodes are available in available in both high definition (16x9) and standard definition (4x3) HD versions are : MP4 (1920x1080), MP4 (1280x720) and MPEG1 (1280x720). SD versions are: WMV (720x480), MOV (720x480), and MPEG1 (720x480). The Committee episodes are available in high definition (16x9) in both MOV and MP4 versions.